Jefferson's Opera House Theatre Players Season opens with "Hank". 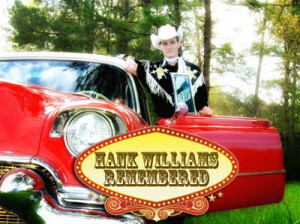 Hank Williams Remembered, that is! 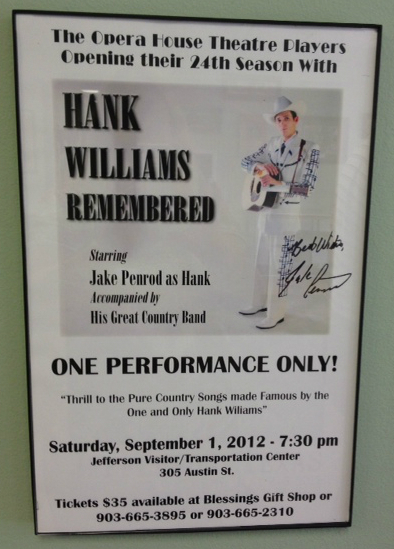 On the evening of Saturday September 1, 2012 come to Jefferson Texas for the one performance of Jake Penrod as “Hank” and his great country band. The show will be at Jeffersons Visitor & Transportation Center building at 7:30 PM. Jake has earned the label “the reincarnation of Hank Williams” and not just based on his voice. He is tall and thin and he dresses western; vintage western, with flashy shirts, boots and a cowboy hat. His face is thin with high-set Cherokee cheekbones so he not only sounds like Hank; he looks like Hank. 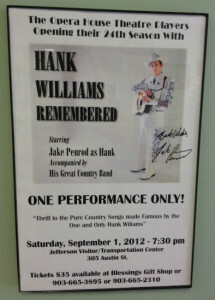 Visit Jake Penrod’s website for more information about this wonderfully talented young man. This entry was posted in Entertainment, Theater by Tammy D. Bookmark the permalink.